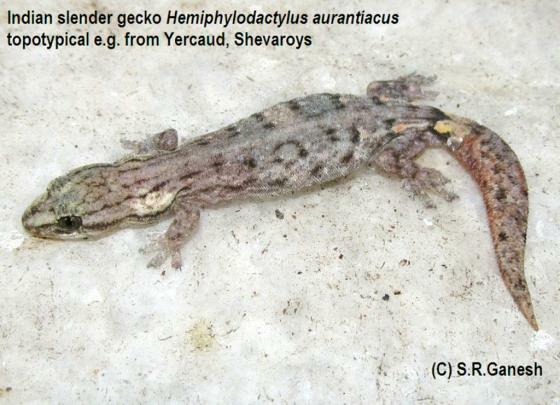 Can you confirm these amateur observations of Hemiphyllodactylus aurantiacus? Type locality: “Shevaroys, under stones about Yercaud and elsewhere, at an elevation of 4,000 feet”. Comment Major diagnostic features: bisexual taxon; pigmented caecum and gonadal ducts; in adult males femoral pore series separated from precloacal pore series (TotPore typically ␣20-␣25), always absent in females; chin scales bordering mental and first infralabial not greatly enlarged; digital lamellae formulae 2-2-2-2 (fore- foot) and 2-2-3-2 or 2-2-3-3 (hindfoot); average adult SVL ~33–35 mm; bold body pattern of contrasting dark brown and dusky brown background and dorsal postsacral double bar of dark brown and light orange (ZUG 2010). Distribution: ZUG (2010) believes that its occurrence in Banglore is edificarian and appears to represent a recent accidental transport. Etymology Beddome offered no explanation for his choice of aurantiacus as the epithet for his new species. 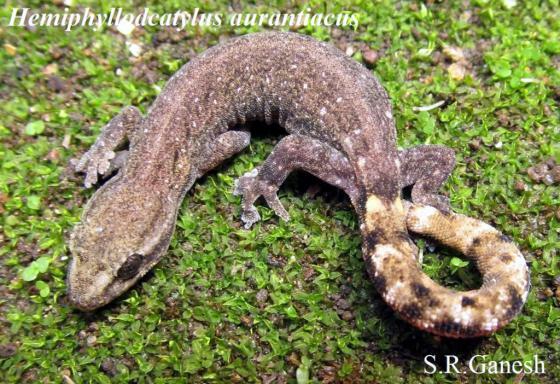 He did mention the orange color of the tail base, and because aurantium is a new Latin noun for the orange (fruit), ZUG (2010) suggested his choice derived from the association between the color of the orange and the gecko’s tail.